Primephonic review | What Hi-Fi? Rarely does something sound as good as Primephonic’s classical music streaming service and still receive a two-star review, but that’s what happened when we tested it almost two years ago. It was simply infuriating. Baldness had not been uncommon in the What Hi-Fi? office before starting our subscription, but after days of tearing out our hair attempting to navigate the service, it had become an epidemic. Evidently, it wasn’t just us struggling to fathom exactly how Primephonic was supposed to work – the company has revamped its service entirely, improving upon almost everything so that only its pricing system and purple and green colour scheme remain. It begins with the Primephonic catalogue. Before subscribers had the run of approximately 100,000 tracks – which sounds like a lot until half your searches return a blank – while now that number has increased ten-fold to more than a million. It still isn’t an entirely exhaustive library. Contemporary classical was a major blind spot during our initial testing, and it's still where Primephonic is most lacking, but, where some artists had been completely ignored, there are usually at least a couple of works now present. Composers we mentioned in our previous review such as Arvo Pärt and Philip Glass now have a more extensive catalogue available on the service, though you’ll still be left wanting for much by way of Lubomyr Melnyk or Nils Frahm. But the library is growing daily, and is of course reliant on the partnerships Primephonic is able to forge. The ones it has with Warner Classics and Sony Classical help, as do those with specialist labels such as Naxos, Harmonia Mundi, Chandos, Bis and 2L. What the company considers truly to be classical music will also play a part; we were less surprised not to find works by experimental classical saxophonist Daniel Thorne, for example. That its modest collection wasn’t our gravest concern with Primephonic should give an insight to how frustrating it was. “Results shown are listed by album and playlist first, related composers/artists second (sometimes it doesn’t even come up with the composer you’re searching for), and then ‘works’ – which, annoyingly, aren’t playable tracks,” we wrote in 2017. Do the same search today and Primephonic will show you works, recordings, albums and tracks in that order, and they are all playable. Even if you get the name of a piece marginally wrong, it will still usually point you in the right direction. If that sounds like the least you should expect from a streaming service, we’d tend to agree – which is why we gave Primephonic a harsh review in its earlier form. The improved ease of use now extends offline too. An update, due to roll out in May, will allow users to download personalised playlists for offline listening when there is no wi-fi connection. That offline functionality should also include full albums shortly. We'll update this review once we've tested offline listening. Perhaps as much as ease of use, our favourite aspect of the new Primephonic site is its ease of access. Classical music can be quite a daunting prospect, a seemingly closed community of experts and enthusiasts whose circle it can feel near impossible to penetrate. But this is a streaming service that is welcoming not only to those who know what they’re looking for, but as much those whose previous experience of classical music was their school assembly. The service’s home page lays numerous paths to finding music old and new with scrollable sections including new releases, daily recommendations, essential artist playlists, hidden gems and iconic albums, as well as playlists centring around instruments, nations of origin and period of composition. 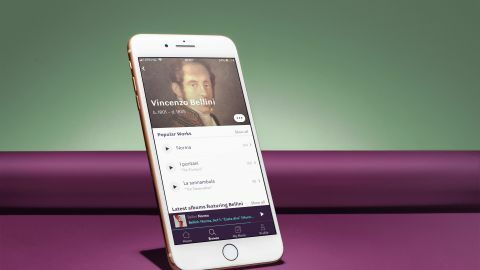 Primephonic quite rightly bills itself as the streaming service for classical music enthusiasts, but we can think of few better ways now to enter the genre from a standing start. The recent creation of iOS and Android apps, where once there was only the browser app, only serves to make its music more accessible. Sound quality wasn’t a problem for Primephonic, but that hasn’t stopped it improving in that aspect as well. A Platinum membership – which costs £15 ($15) a month or £150 ($150) a year – now facilitates lossless 24-bit FLAC playback where once its upper limit was 16-bit CD quality. There is also an MP3-only Premium package, costing £8 ($8) a month or £80 ($80) for the year, though even the capabilities of that are up from 192kbps to 320kbps. Of course we would direct you to the higher tier and some worthy partnering kit – think at least an Audioquest DragonFly DAC and a good pair of headphones – to bask fully in the sound for which you’ve paid. From a companionless oboe to the densest arrangement for full orchestra, Primephonic is wildly competent at delivering a dynamic, musical performance, with soundstage shared generously among sonic components. You can hear air rushing through the pipes of an organ, the varying intensities of rumbles and booms of the timpani and delicacy as a pianist strokes the keys of their instrument. If Primephonic’s aim is to shine a spotlight on the tone and timbre of an orchestra, as much as the emotion held within the notes it plays, then its job has been done admirably. Our mood toward Primephonic has taken an about turn. From being a bright concept woefully executed, it is now a service we could recommend as a go-to for existing classical music fans and those wanting to expand their sonic horizons alike. The library is not yet as exhaustive as we’d like – for fans of more contemporary or experimental classical music, a Tidal subscription would also be a must – but it is growing and there are already thousands of tracks here you won’t be able to stream elsewhere. We'd quite like a dedicated desktop app, too, and (for now) we're assuming that offline listening will work as billed, but should the library one day get close to exhaustive there would be little keeping us from giving Primephonic its fifth star.